Radon comes from the natural radioactive breakdown of uranium in soil, rock, and water. It is an invisible, odorless, tasteless, cancer-causing gas that enters buildings through the numerous cracks, holes, and pipes in the foundation. It can also enter a building from well water. Radon can be found in any building, but homes are the most concerning since that’s where families spend the most time. Radon is prevalent in Colorado and in Boulder County. One out of every two homes in Boulder County has elevated radon levels. The EPA has ranked Boulder County as “Zone 1,” which means the average house will likely exceed the EPA’s action level of 4.0 pCi/L. 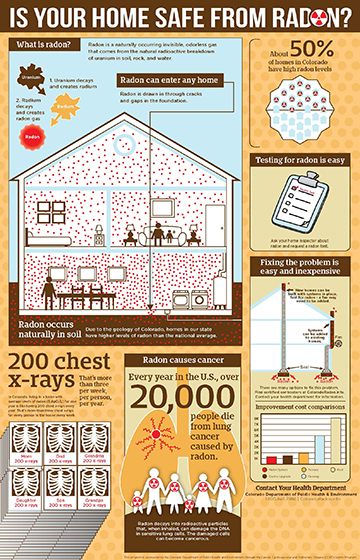 Radon breaks down into radioactive particles that can cause cancer when inhaled. These radioactive particles can damage the cells in our lungs and increase the risk of lung cancer. Radon is the leading cause of lung cancer among non-smokers. It is estimated to cause about 21,000 lung cancer deaths per year and about $2 billion in medical expenses and lost productivity. The Iowa Radon Lung Cancer Study tracked nearly 1,000 women who had lived in their homes more than 20 years. The results of the case-control study (after adjusting for age, smoking, and other factors) indicated that a 20-year exposure of radon levels at the EPA guideline of 4.0 pCi/L yielded an increased lung cancer risk of 50%. Smokers exposed to high concentrations of radon have even a greater risk of developing lung cancer than being exposed to either substance individually. The risk of lung cancer from radon gas is estimated to be approximately 10 -15 times greater for persons who smoke cigarettes in comparison with those who have never smoked. Get help Quit Using Tobacco. The following video features Johanna Carpine of Wellington, Colorado. She was diagnosed with radon-related lung cancer in 2013. After a two-year battle, Johanna died on August 21, 2015.